It’s been an eventful 12 months for global trade. The UK voted for Brexit, the US elected Donald Trump, and anti-globalization sentiment surged across many regions. 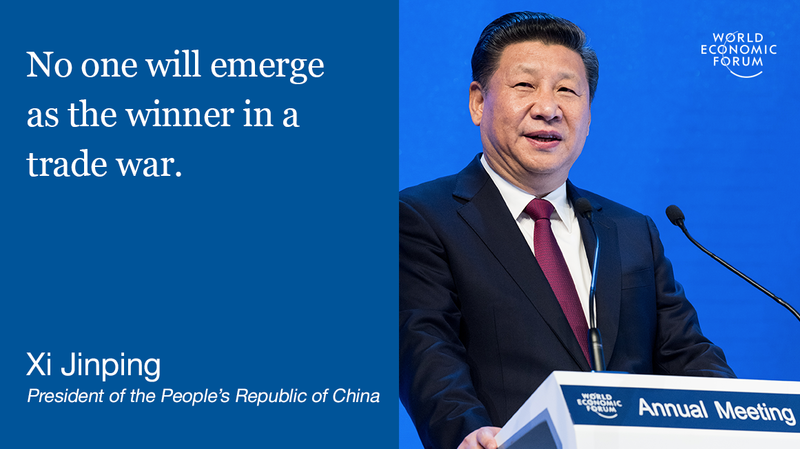 In a move that captured headlines around the world, Chinese President Xi Jinping delivered a resounding defence of globalization and open trade. “We must redouble efforts to develop global connectivity to enable all countries to achieve interconnected growth and share prosperity,” he said, while adding that trade and investment rules needed to catch up to today’s realities. While the premier’s speech received a warm welcome in sub-zero Davos, corridors were abuzz with talk of its possible implications, ranging from China’s contribution to future global prosperity to the country’s influence on regional integration initiatives. “I think we should try not to talk ourselves into a trade war,” said Roberto Azevêdo, Director-General of the World Trade Organization (WTO) as he discussed the future of open trade. It was a plea echoed by a number of others throughout the week. “It is difficult to overstate the extent to which this return to pure power politics in international economic relations would represent a break from the past 70 years of rule-based integration,” over dozen ministers gathered in Davos concluded , borrowing from Hollywood to cast the good, the bad and the ugly scenarios for the future of world trade. In a bid to settle nerves, Trump ‘s envoy to Davos Anthony Scaramucci vowed that the new US leader wanted trade, not war, through a “strong bilateral relationship” based on “more symmetry” in trade deals. Globalization, and by implication the trade and investment frameworks that help to underpin it, needs to be improved. This was the message carried by numerous speakers at Davos last week, as they debated whether and how to better communicate the benefits of globalization – and, more critically, how to make it work effectively for all. “One of the things we are going to have to come to terms with here is that there have been significant losses [from globalization] and it is not clear to me that we are going to be able to remedy them under the current infrastructure,” said economist Dambisa Moyo in a panel on Governing Globalization . Also in Davos, the World Economic Forum released the Inclusive Growth and Development Report 2017 . It offers a new policy framework and accompanying indices to highlight specific areas governments and business leaders need to address – including around international trade and investment cooperation ­– to ensure wealth gains are more evenly distributed, opportunities boosted and global growth put back on track. 4. A new year, a new deal? As the US cans its commitment to the Trans-Pacific Partnership (TPP), a new deal stepped into the spotlight in Davos. Can the planned Regional Comprehensive Economic Partnership (RCEP) – which currently includes ASEAN nations and their trade partners – deliver the frameworks needed for future inclusive growth in the region? ASEAN economic integration has already delivered significant benefits for small and medium-size enterprises, as well as encouraging a fintech revolution, according to Anthony F. Fernandes, Group Chief Executive Officer, AirAsia Bhd. Elsewhere in Davos, questions around the renegotiation of the North American Free Trade Agreement (NAFTA) also loomed large. Here is Kishore Mahbubani of Singapore University, saying that Trump is shooting America in the foot by abandoning the TPP. The week closed with the WTO Trade Facilitation Agreement (TFA) on the verge of entry into force, with just two countries now needed to ratify in order to secure the required support. The TFA, once in play, will create binding obligations on countries to undertake customs reforms that should help to reduce trade costs and speed goods through borders. Davos saw ministers and CEOs roll up their sleeves on TFA implementation through the Global Alliance for Trade Facilitation . Looking ahead, WTO members are preparing for a ministerial conference scheduled for December 2017 in Buenos Aires, Argentina, with a list of talking points that includes domestic agriculture subsidies, food security, harmful fisheries subsidies, and services trade and investment facilitation, as well as issues of interest for least developed countries, e-commerce and small businesses. Here's Roberto Azevêdo, WTO director general, on trade under Trump. After months of speculation, UK Prime Minister Theresa May has unveiled – first in London and then in Davos – a plan to extricate Britain from the EU single market, negotiate a free trade deal with the bloc, and build a global Britain. The UK may have its work cut out, given the time it takes to hammer out trade deals, and may have to wait its turn among the 17 other countries currently negotiating with the EU, according to some experts. London will also have to rectify its arrangements at the WTO and with the 40-plus existing EU trade partners. It will also have to renegotiate its relationship with Donald Trump in the US. And if anyone thought Brexit has made the future look uncertain, “I think the change of administration in the US has introduced an even bigger piece of uncertainty,” said Philip Hammond, Chancellor of the Exchequer of the UK. In one day, more data comes off a GE Power gas turbine than a person could put on social media in a year, according to GE President and Chief Executive Officer Steve Bolze, who added that software had dramatically changed the way the company does business. “The industrial internet will be two times as big as the consumer internet,” says Bolze in this session on the future of the digital economy . The question is how best to manage cross-border data flows – a core feature of the Fourth Industrial Revolution – at the same time as building consumer trust, protecting privacy and tackling cybercrime. “Focus on knowledge crossing borders as the driver of new globalization, and goods crossing of the old. There’s still some old globalization, but it’s a different mindset, and it has many different implications for policy,” said Richard Baldwin of the Graduate Institute of International and Development Studies in this Facebook Live interview. Inclusivity is key. There need to be better global rules for e-commerce and small and medium-size enterprises, and these should be shaped by businesses and endorsed by governments, said Chinese businessman Jack Ma in a one-on-one interview. When it came to the global cross-border investment regime, there was a wind of change (or at least reform) blowing through Davos, with discussion afoot between ministers and other stakeholders as to a new investment court proposed by the European Union and Canadian government. It would be a permanent international, multilateral body that would adjudicate disputes under future and existing investment treaties.